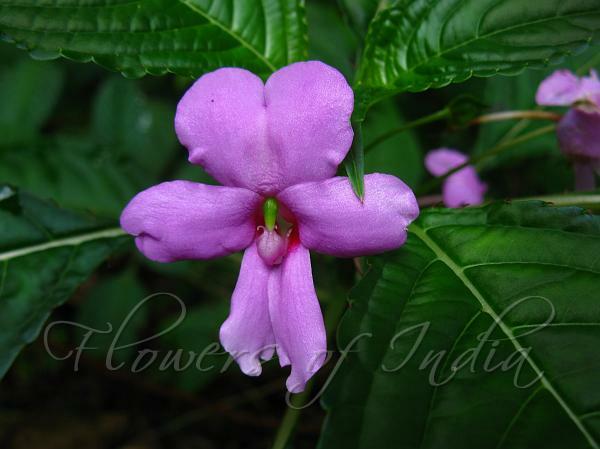 Synonyms: Impatiens flaccida sensu Hook. 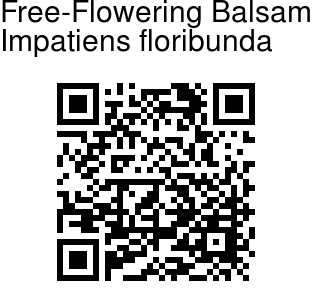 f.
Free-Flowering Balsam is an erect or prostrate herb up to 70 cm tall, with stems branched, green. Flowers are borne singly or in fascicles, purple, flower-stalks up to 2.5 cm long. Lateral sepals are small, ovate. Lip is boat-shaped, spur slender, straight, wings bilobed. Leaves are alternate or opposite, rarely whorled, elliptic-lanceshaped, caudate-tapering at tip, 2-10 x 1.2-1.4 cm, sawtoothed or rounded toothed-sawtoothed along margins, apiculate from tip. of teeth, glaucous beneath; leaf-stalks 1.5-3.5 cm long with stipitate glands. Seeds are spherical. Free-Flowering Balsam is endemic to Southern W. Ghats, at altitudes of 1800-2100 m, found generally in Tamil Nadu and Kerala. Flowering: July-November.